Best Antivirus for Windows 8 I have ever used. It provided me with 360 degree real time protection when my PC was infected by a malicious trojan called Generic PWS.y!6776EDE137A7. 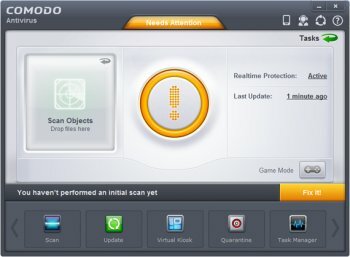 After installing comodo Antivirus it removed this malicious trojan. Both are good Security Software and its available on SoftMozer. SoftMozer is a free software download site offering free software for windows, mobile, mac, linux & IOS. Experience the safest and fastest download free games and download free antivirus for multiple platforms. why oh why all the bloat, no wonder its nearly 220meg for a virus checker. WHY? Do you call the full suite by Comodo "bloat"? I installed it and am using the AV, FW, and HIPS, and the TOTAL memory used SYETM WIDE is MAYBE 180MB thatincludes the OS as well as all other items in memory. So, I guess you have a rather perverted definition of bloat. Excellent package, very good protection and NO BLOAT at all on my machine. BTW, that is a Dell Dimension 2350 with a 2.2GHz P$, 1 Gb RAM, and a 128Mb Vid Card. Also WinXP SP3. Please find standalone downloaders for firewall and av below. Alternatively you can do a custom install choosing either firewall or av or both from its suite. AFAIK there's no stand-alone Antivirus solution from Comodo, same as there's no stand-alone Firewall. It always comes as a Security Suite. I'm using version 5 and am very happy with it, but version 6 is a design abonimation. I am using Comodo and i am so satisified with it . Pros: The new version has a much higher detection rate that when I tried it in the past and works seamlessly with Comodo Firewall and Defense +. It also has an effective behavior blocker. Cons: Not really cons, but it does not directly scan email or have a web shield like avast! does. Comodo seem so effective that it catches stuff that may come through email or the web anyway.